The Macrobiotic Diet is part of the Far Eastern philosophy of Macrobiotics (literally “Great Life”). Despite a reputation of being nothing but brown rice, there is more to the Macrobiotic Diet than just brown rice. The food guidelines have been evolving over a number of years. Food should be organically grown and eaten fresh. The Macrobiotic lifestyle also governs how food should be prepared. No microwave should be used – rice must be cooked in a pressure cooker. Food should be eaten and chewed slowly, in a relaxed manner. Sugars, spices, alcohol, eggs, meat, and cheese. This has everything to do with the extreme yin and yang properties. What’s good about the Macrobiotic Diet? The macrobiotic diet is high in natural, unprocessed foods, complex carbohydrates, and vegetables. It is low in saturated fats, whilst providing the essential fats. It could be considered a weight loss diet, due to these factors, and the potential lower calorie count. However Macrobiotics is more of a way of life, than just another weight loss fad. There are a number of claims made about the healing properties of the macrobiotic diet. Conditions such as cancer and heart disease have apparently been aided by this diet. However some claims are unsubstantiated. The macrobiotic diet can be fairly strict. Where a diet is strict there is a potential for nutritional deficiencies – particularly calcium and iron. 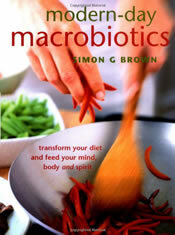 Modern Day Macrobiotics which retails for $19.95. How does alcohol affect the macrobiotic diet? Eating macrobiotic has added balance to the medecines I take for my chronic disease. I Have NO vitamin deffiencies and I do not stick to the macrobiotic way.But I do stay away from dairy and sugars of all kinds.I feel wonderful thanks to macrobiotics!! John Miller – you don’t need to have a macrobiotic clinic in your area to learn about it. Google Mina Dobic whose a consultant. If you can get to LA or San Diego for a consultation, she will give you a individualized diet plan to follow, tell you were to find everything you need, and literally walk you through it. You could also consider hiring a chelf in your area that’s familiar with the diet (google your area for one) and have them teach you how to cook the diet items. It’s doable. Mina will walk you through the “how to do this”. wished i could find a macrobiotic clinic here in nothern california where i live. i think this diet might be a way for me to live with and possably cure my cancer. i got follicular lymphoma and my version of this diet dropped my resting heart rate by 20 beats a minute in a three week period camping in the woods. i regained the unwanted 20 beats a minute when i came out of the woods and started eating more crackers and bread. Not a whole lot of info, but what is said is right on and true to my experience of the “movement”. However, they may have mellowed in the last 30 years, but practitioners and teachers used to be quite strict, almost militaristic, and it had the tendency to attract authoritarian types. Macrobiotic diet as long as I know is the best way get healthy. The way is the nature way. i have celiac disease along with milk and egg allergies, i was told this was the only diet possible for me. you didnt have a whole lot of info, but a good start….